I don’t claim to be an expert in many things, but one I can quite proudly start claiming (I think) is being an expert light packer. My secret to packing lightly: lists, lists and more lists. I make a ridiculous amount of lists, often re-writing them and eliminating as I go. My theory is that if I am unsure about something I leave it off completely. If I happen to miraculously need that pair of high-heels (which, let’s be honest, are never needed on a holiday) then there is nothing that you can’t find in the shops that side. My down-fall always used to be when it came to toiletries and make-up as these can get really heavy very quickly. Travel size skin kit – I am a huge fan of Dermalogica one’s. They have everything you need and are obviously re-fillable so money well-spent. One kit contains your cleanser, spritz toner (which is great for in-flight hydration), moisturiser, exfoliant and eye-cream. All the sizes are pretty generous and should last you more than one holiday. I’d say about 1 month of solid use. I always go for the Normal/Dry skin kit and generally with the change in climate on holiday and the long-haul flight my skin needs the extra hydration. Samples – you can’t underestimate samples for travelling. I keep all of mine in a toiletry bag and come holiday time I take as many as possible – great for masks, oils and serums that you are keen on trying. Counters like Kiehls, Clarins and Dermalogica are usually quite generous if you’ve made a purchase. Fragrance – fragrances are heavy and you use so little so it’s such a waste taking a whole bottle. Rather gather a few sample tubes or find a mini travel size. Otherwise, duty-free is always a good excuse to buy one. I always go for the last option - my little pre-holiday treat is to buy myself a small perfume in duty-free; that way I forever associate that holiday with that scent - such good memories! Alternative, Lush to great solid perfume which are light - I love Vanillary. Brush - Tangle Teezer, obviously. Super-light and compact. They do these great travel versions too. Find this on Everything Hair. Lastly, when it comes to in-flight pampering I always pack a separate small toiletry bag that I keep in my handbag. This is full of a few multi-task products and able to help with jet-lagged, dull skin. A good mask - this is one product that I will always pack full size as travel-skin is often a bit all-over-the-show, thus a deep-cleansing and a super-hydrating mask are very important. My Sisley Black Rose Mask is always with me as well as my Aesop Parsley Seed mask. Both are small bottles and very light. I apply the hydrating one after I have cleaned my face when boarding. I keep it on until just before the landing - a good facial oil works wonders too. Face Wipes – to clean my face when I board the flight (I also keep the mini Dettol one's for my hands). Hydrating spritzer – I constantly spritz this all over my face during the flight. It adds hydration and keeps me feeling fresh. Use your Dermalogica toner from your skin kit to save space. QMS Sports Active – small tub – for post-flight make up. Nothing makes for glowing skin like this stuff. Also has hydrating benefits and sun protection so can be used on the trip. Clinique Baby Tint – for post-flight make up. This adds a lovely pink hint of colour to the lips. Very natural and hydrating. Piz Buin Lip Balm – for dry lips, obviously. Elizabeth Arden 8 Hour Cream – for any other use I may need - these types of products will always come in handy plus I have a few travel-sizes of this lying around. Hand cream - again, find a small version here. I find Crabtree & Evelyn do those mini tubes which are perfect. This is a must though, as I can't stand the feeling of dry hands. Remember that if you happen to not have a travel size of anything, invest in travel containers (link) and decant product. I do this for all my hair products as am very particular with what works for my hair. The weight of your luggage really does make all the difference and, in my mind, truly is something worth investing in - I am such a fan of the latest range of Travelite luggage called TravelSmart - the suitcases have a built-in scale so weigh themselves - what a win! 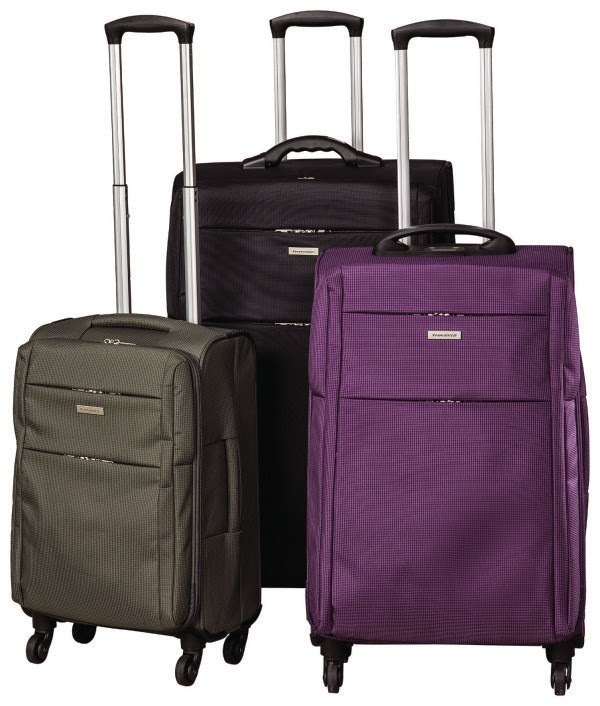 The bags also have 4 wheels with 360 degree spinners so are super-easy to wheels around. The suitcases also have built in combination locks for extra safety. The cases are made out of super-hard-wearing polyester fabric that is also water-resistant and resistant to dirt and abrasion. The range comes in three colours; black, grey and grape. The range is available at Frasers stores as of the end of last year. Those suitcases are amazing! Can't believe no other luggage companies have thought of that until now! I know, such a simple yet obvious idea and just makes packing and travelling so much easier!